...that when a Flood infection form infests a host it can instantly acquire their memories? ...that the Interplanetary War was concluded with the signing of the Callisto Treaty? There is more information available on this subject at Epsilon Eridani system on the English Wikipedia. Not to be confused with the Eridanus system. 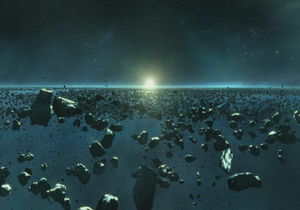 The Epsilon Eridani system (sometimes rendered ε Eridani) is a planetary system situated 10.5 light-years from Earth, is identified as a region in FLEETCOM Sector One. It was home to several habitable planets colonized by the Unified Earth Government, most notably Reach. At 10.5 light-years from its sister system, the Sol system and is one of the closest neighbors of humanity's homeworld. In the summer of 2552, the Covenant invaded the system and attacked Epsilon Eridani's major colonies. Reach ultimately fell to the Covenant and was glassed, while Tribute was brutally assaulted and partially glassed. Following the Human-Covenant War, at least Tribute and Beta Gabriel had been resettled by humanity. By the early 21st century, scientific observation had deduced the presence of an inner rocky asteroid belt, an outer icy belt, and at least three planets: a gas giant the size of Jupiter, and possibly two terrestrial planets, near the inner and outer belts, respectively. The Epsilon Eridani system was recognized to have an improbably high number of habitable planets, a fact that was seen as serendipitous to the early colonization efforts. Initial colonization efforts in the system faced significant challenges in marshalling political and economic support. Interest in the system's colonization potential initially focused on Tribute and Circumstance, though it was Reach that would soon capture the attention of UEG planners. The system was originally colonized by the colony ship Odyssey with the first wave of humanity's extrasolar colonization in 2362, landing on Reach. Afterwards, Tribute was colonized on August 8, 2364 when CAA Casbah arrived and established the initial navigation and communication satellite constellation on the planet, with Circumstance following shortly after. By the late 25th century, the system had become home to many of the UNSC's strongholds and military bases, such as Reach. It was protected by the UNSC Epsilon Eridani Fleet. Before the Fall of Reach, Epsilon Eridani's superior interstellar jump point had been the most active Slipstream space transfer zone (arrivals and departures) for over thirty years, with Epsilon Eridani's inferior IJP and Sol's superior IJP regularly trading second and third place spots. Humans held the system for several hundred years, until the Fall of Reach in 2552. After that, the system came under control of the Covenant. By 2553, however, humanity had reclaimed the system and had started recolonizing Reach. By 2589, the planet had been partly re-terraformed to a livable state and continued to see an influx of new colonists. Tribute was similarly reclaimed and became a new center of military and economic growth in the postwar era, providing critical wartime materials to the postwar UNSC as Reach continued to recover. Reach – The former military center of the UNSC, and the most developed human colony. Glassed in 2552 and partially reterraformed by 2589. Tribute – A major human colony, known for its strong industrial capacity and large population. Partially glassed during the Battle of Tribute, under UEG control as of 2558. Beta Gabriel – largely uninhabited, converted into an outdoors resort by wealthy entrepreneurs. Occupied by a Brute pack during or otherwise soon after the Fall of Reach. Circumstance – A world-famous for its universities and courts of justice. Status unknown. Tantalus – A human colony with an unknown status after the Covenant's siege in the system. Epsilon Eridani IV – known to be the site of an Insurrection. A holographic rendering of the system. Reach, the military center of the Epsilon Eridani system. Epsilon Eridani in the sky as viewed from Earth. A space engagement above Reach. ↑ Halo: Contact Harvest, "Prologue"
↑ Halo: Evolutions - Essential Tales of the Halo Universe, "Stomping on the Heels of a Fuss"